The power of education gives people the ability to change their lives. Carol Maya is a testament to this incredible feat. She is one of seven children. Her mother worked day and night to single-handedly support the family after Carol's father stopped sending remittances abroad. Carol's mother endured a lot for the family to get by. She took up manicure and pedicure jobs, cleaning requests, and even laundry items. Being a resourceful person, Carol's mother cooked up bread rolls to sell in their schools. All of these she does while working as a community worker and an assistant secretary for Looc-Balete Development Association, Inc., an ABS-CBN cooperative program on sustainable and caring communities. 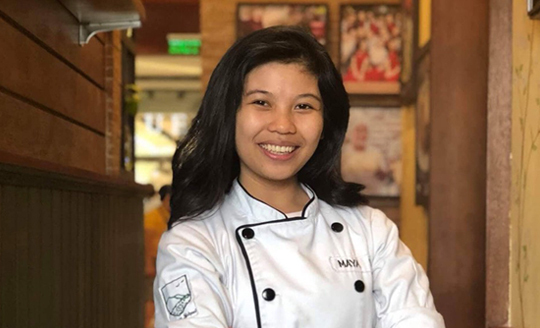 Through her mother's relentless hardwork and ABS-CBN's intervention, Carol was able to enroll at Punlaan School where she was able to gain skills in the restaurant and hospitality sector.